Loren Brichter’s comeback app isn’t a Twitter client, something that works with Tent.io, or a revolutionary implementation of multitouch on the iPad. It’s a word game. It’s called Letterpress, and it’s available for free on the App Store. I’ve been able to beta test it for a while, and it’s quickly become one of my favorite games on iOS. One I instantly reach out to whenever I have 5 minutes to kill. Letterpress is similar to SpellTower, but it’s focused on multiplayer and has deeply different rules when it comes to assembling words. Letterpress is very easy to pick up. Firstly, players make turns making words from a 5x5 board of letter tiles. You can tap any tile and make a word, then tap Submit to end your turn and make tiles into your color. The game ends when every tile on the board has a color, or when both players pass their turn in a round. Words must have at least two letters. You can only place a word once. Words can’t be a prefix of a previously played word (e.g. “dog” and “dogs”). The core concept of Letterpress is that you’re having fun playing against a friend to see who’s best at composing words off randomly placed letter tiles. While I could end my review here, Letterpress features Loren’s typical attention to detail and digital craftsmanship when it comes to putting together a piece of software for Apple devices. For instance, there’s a strategy element to the game that involves defending tiles. By surrounding a tile with other tiles of the same color, users can “protect” it. A protected tile won’t be stolen by the opponent – ie. it can be used to compose a word, but it won’t change color. It’s easy to imagine the consequences this design choice has on Letterpress. A common strategy I’ve seen in the past weeks is to start from the corners (so you only need two tiles to protect another one) and to defend vowels, because those are essential to assembling a word. I try to apply this strategy as well, but sometimes I just can’t resist playing a funny word against a friend. From a design standpoint, Letterpress is (obviously) quite a departure from Loren’s previous experiences. When I first launched the app, it somewhat reminded me of Microsoft’s Metro design language: the clean default theme, the focus on typography and tiles, the horizontal scrolling mechanic of the initial screen were reminiscent of Windows Phone’s general aesthetic. But upon digging deeper into Lettepress, I soon realized this is, in every corner I looked, an iOS app to the core. It comes down to the smallest details that make great iOS apps great. The way a game is shredded when you remove it. The cool mix of retro and ’80s-inspired themes available in the app. The way tiles of the last-played word jiggle briefly when you open an ongoing game. The way “your turn” pops up for a second when you start a new game, then disappears automatically. The subtle physics of the tiles: try to slowly drag them around, or replace a letter inside a word with a new one. Also: their shadows. The way the players’ “avatars” bounce at the top of the screen and overlap when you start assembling a word. To paraphrase my friend Shawn, this isn’t a Twitter client, but Brichter is still sweating the details. With Letterpress, Brichter is trying the so-called “freemium” approach: the app is free, but you have to pay to unlock more features. Specifically, a $0.99 in-app purchase will let you play more than two games at the same time, it’ll unlock themes, and it’ll allow you to see played words during a game. I think it’s a smart move, because Letterpress’ in-app purchase is a must-have so, essentially, you’ll be purchasing a $0.99 paid app. In this case, the “free” price tag is an illusion to draw more customers to download the app right away: think of it as a “trial” version of the real Letterpress. This is what the App Store dynamics have become, and Brichter is simply experimenting with something completely new for him while playing by the market’s rules. Because while I could go by without themes – I just use the default one – more simultaneous games and played words is what you’re really looking after. 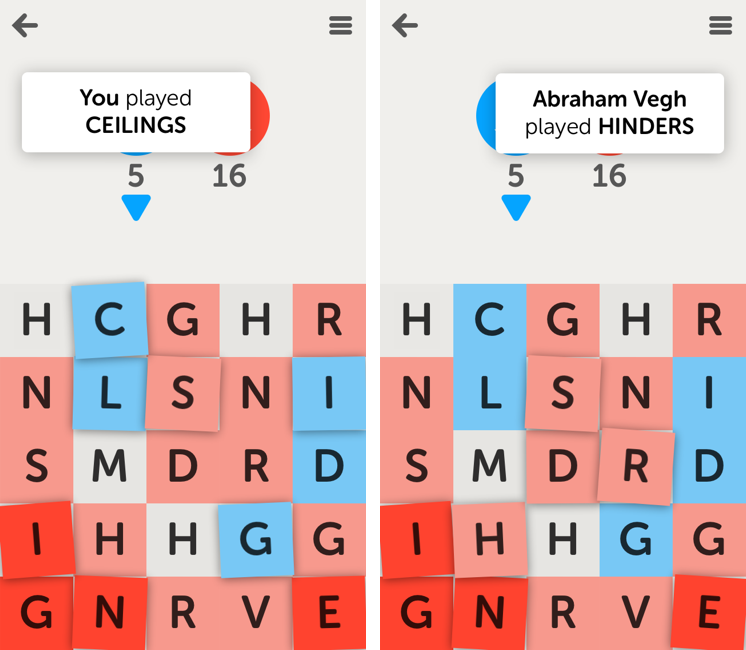 By design, Letterpress is meant to host multiple games going on at the same time: play a word, start another game, play a word, wait, and so forth. 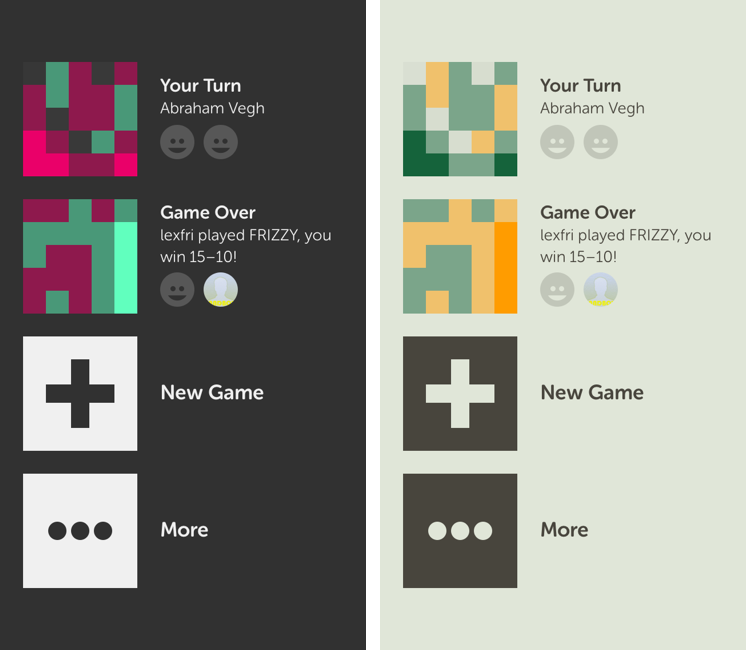 For me, Letterpress would be incredibly boring with only two simultaneous games. And in those games, not having access to the complete list of played words would make me play existing words 50% of the time. I really recommend spending the extra buck to buy the real Letterpress. 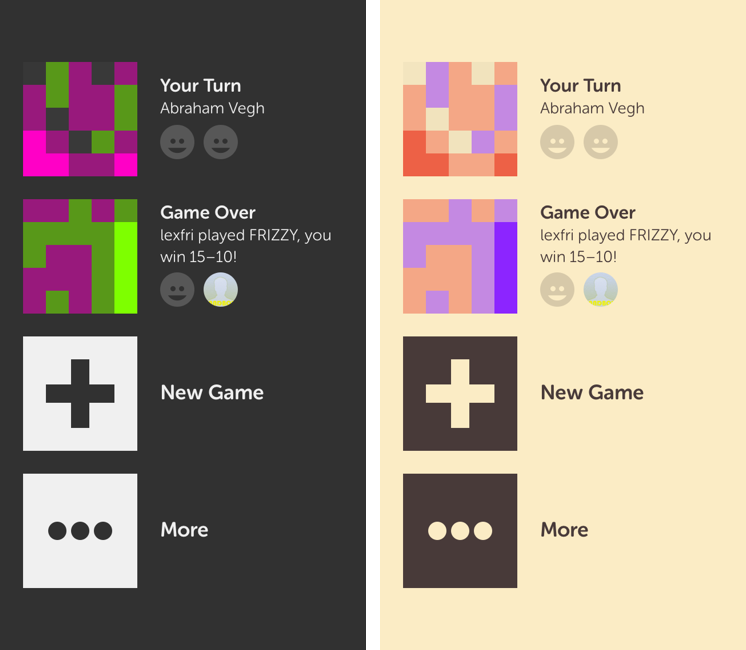 Letterpress is entirely based on Game Center. 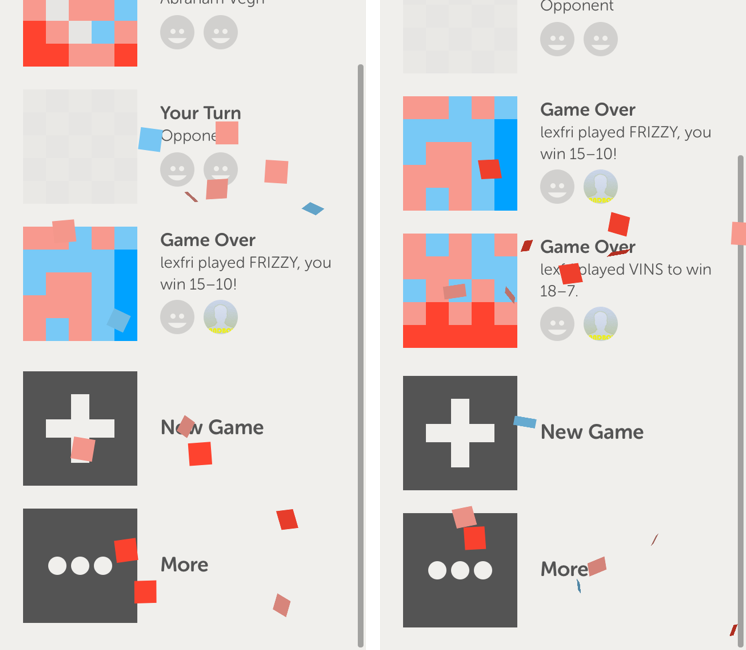 With iOS 5, Apple introduced new APIs for turn-based games, which let apps like Letterpress organize a match in turns and send notifications when it’s your turn again. I don’t use Game Center much – mainly because I feel bad when I see my “awesome record” is not even listed in my friends’ leaderboards – but admittedly, for all its flaws, the system makes it easy to auto-match and start playing in seconds. It was easy to find opponents during the beta, and it’ll be even easier now that the app is public. A lot of things have changed on the App Store since he had an app for sale, but I think he’s still “got it”. Letterpress is well-designed, fast, social, classy, and, ultimately, fun. If you abstract these qualities from the app’s game nature, Letterpress is not too different from Tweetie. I like Letterpress. It’s easy to play, it works with my Apple ID, it’s got a clean design, it’s universal, and it lets me be creative with words. For more, read our interview with Loren Brichter here.